Unlike other book makers, we do not have preset formatting, and your book can be in any format within our minimum and maximum sizes. We make custom books in 1/4 inch increments from 4" x 4" to 14" wide x 12" high without any cookie-cutter limitations! To calculate the size of your cover, use our Cover Size Calculator. 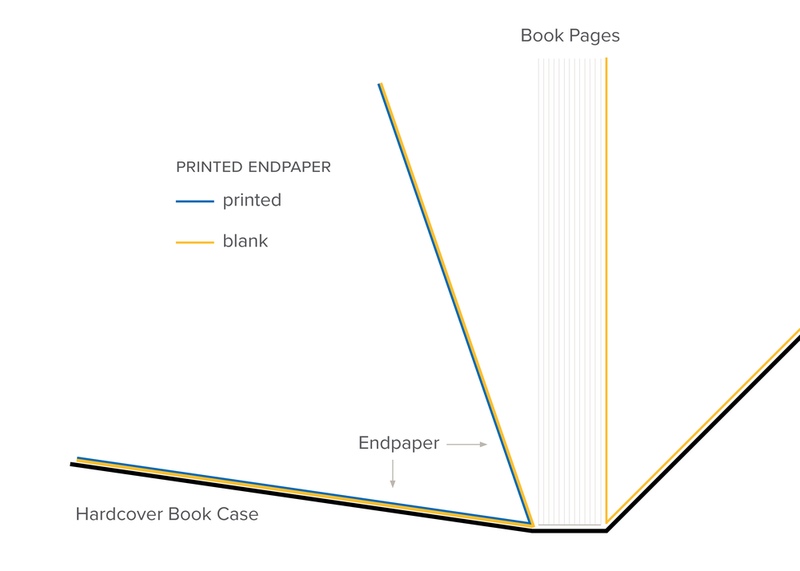 Unlike softcover books, hardcover book covers are slightly larger than the their contents. This is because the cover extends beyond the trimmed edge of the contents by 0.125" (1/8") as illustrated at left. The result is that all hardcover book covers are 0.25" (1/4") taller and wider than their contents. For example, an 8" x 10" book will have a cover that measures 8.25" x 10.25". Please keep this in mind when creating your files! We stock Matte, Soft Touch Matte, Semi Matte, and Gloss laminate. These are used on covers, inset images, printed wraps and dust jackets. We cannot laminate interior pages. Max. Foil Stamping size: 5" x 12"
Note: If your foil stamping design will not fit on a single die, it may be necessary to use two dies, which will add cost to your book order. The recessed area of inset images is 0.25" (1/4") taller and wider than the printed image, which results in a 0.125" (1/8") border. We place inset images on the horizontal center line of the cover, just above the vertical center. If you have specific placement requirements, please send us a PDF mockup of your cover. For inset images, we accept TIFF, JPEG or PDF files, sized to match one of the preset sizes at 300 dpi with 0.125" bleed. For File Preparation and all other Finishing Options, please go to our Prepare Your Files page.